timelessmoviemagic blog | The Day Arlene Dahl Bought a Film Poster Off of Me! You are here: Home » Stories » The Day Arlene Dahl Bought a Film Poster Off of Me! Selling and collecting vintage movie posters is my passion and it brings me into contact with many different people from different continents. I have sold to collectors and enthusiasts from Canada, USA, Brazil, Peru, Japan, Australia, New Zealand and most of Europe. One of the best things that transpires after selling a poster are the replies of the buyer. I have been lucky enough and consider it an honour to sell posters to famous people and their relatives. Here is just one story of those moments. I purchased a lovely collection of posters dated from 1950-1960. After sorting through them I decided to put some up on Ebay for sale. 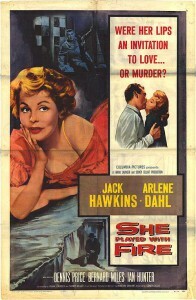 One such poster was from a film called She Played with Fire, a 1957 film starring Jack Hawkins and Arlene Dahl. The film was also known in the United Kingdom as ‘Fortune is a Woman’. This is the image of the poster in question. As you can see there is a stunning image of the actress Arlene Dahl. For people not familiar with her films she also starred in Journey to the Centre of the Earth. So I woke up one morning and checked Ebay and found that someone had purchased this poster, after going through the usual form of a sale, emailing them a delivery date and then shipping the poster off, it was only when I received feedback a few weeks later that I noticed the username of the client in connection with the poster. I then decide to email the buyer to ask if there was any connection with the actress Arlene Dahl. Not really expecting a reply back I received an email a few days later… saying it was Ms Dahl’s secretary purchasing the poster on behalf of Arlene Dahl! I emailed back saying it was a privilege to offer her a poster and wondered why she hadn’t got a poster of this film. Maybe it is because once the film industry have finished making money out of you they really don’t care, I don’t know. After a few corresponding emails the final one I received was that Mrs Dahl was very pleased with the poster and to pass on her gratitude. It’s stories like these that bring a smile to my face, someone like Arlene Dahl who made thousands of people smile with her films in the late 1940’s until the early 1960s, showing appreciation to a movie poster seller across the sea.